The King of Eye Makeup: Eye Shadow or Pencil? In my early 17 to 20's, I was a die heard/addicted to eye pencils for my makeup. I couldn’t go out without pencil, no lipstick I could go and still I can but in that time, without eye makeup never... and in my middle 20's I discovered to comfort of using Eye Shadows. And now my main make up thing is Eye Shadow. 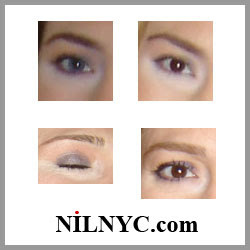 I use as a pencil too under my eyes, and if you use eye shadow as a pencil, your eyes looks more natural and smokey. This Chanel Shade combinations ranging from matte to frost to satin for multiple looks, contrasting or complementary. Apply dry for subtle shadowing. Slightly moistened applicator gives a more intense shade. Organic polymer derivatives ensure smudge-proof long wear, particularly in high temperature or humidity.